Maximize Results From Your Real Estate Website! 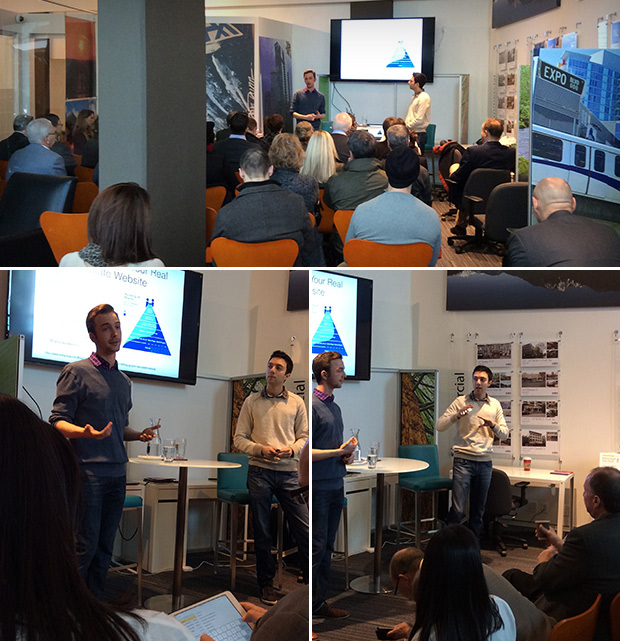 We had the honor or speaking at the RE/MAX Metro Realty office on Pender St. Vancouver this morning on the subject of “maximizing results from your real estate website”. If you haven’t checked out their office, we highly recommend taking a look. We’re super thankful for the opportunity and the event was a huge success! We spoke about ways that you can get the most out of your real estate website and make technology work for you. We realize that not all agents are tech-saavy and that there’s an overwhelming amount of ever-changing places you can focus your time and energy on… from social media networks, to your website and beyond. Our presentation provided a high-level view of the different avenues that you could choose to be involved with from a technology standpoint. It armed you with enough information for you to be able to identify where you should best focus your time and energy. At the end of the day, your efforts need to effect your bottom line… that’s why its critical that you choose your avenues wisely and commit what little time resources you have to the areas that are going to give you the most gain. That means different things to different people, and only when you know the entire spectrum of what’s available to you can you make an educated decision on which paths are worth pursuing. We look forward to presenting to more agents in the future. If your managing broker is looking for a team of passionate web-saavy ninjas to come and bring some fresh perspective to how we approach technology in real estate, please don’t hesitate to get in touch with us!